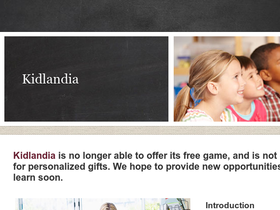 Visit Kidlandia online at Kidlandia.com for personalized gifts for kids. Kidlandia offers personalized maps, door hangers, growth charts, scrolls, prints, vinyl wall clings, puzzles and more. Kidlandia carries personalized themes such as Dora The Explorer, Kidlandia, Real Maps, Sponge Bob Square Pants & Veggie Tales. Save on your next purchase from Kidlandia.com with discounts, coupons, promotions and savings from 58coupons.com. Hurry on over to Kidlandia and save 20% store wide + receive free shipping with this coupon code. Head on over to Kidlandia to purchase personalized jigsaw puzzles for only $39. Click link to view. Shop Kidlandia.com for personalized gifts starting at only $29. Click link to start shopping.